Historians know very little about an early settler to Maryland named Mathias de Sousa. Only a few documents record the details of his life. 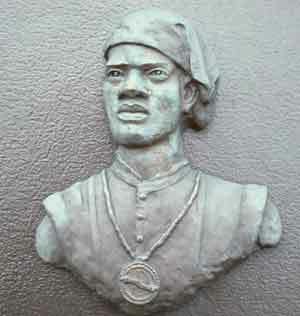 Some people recognize Mathias as the first, free person of African descent living in Maryland. Others simply find his life inspiring. Mathias was a servant who learned skills as a sailor and fur trader to win his freedom. There are some details about Mathias' life we will probably never know, but there are enough facts to tell his story. Mathias de Sousa was an indentured servant who worked for Father Andrew White, a Catholic priest. When Mathias voyaged to Maryland, he worked for Jesuit priests, who were on a mission to establish churches in North America for the Catholic Pope in Rome. When Jesuit officials gave Father Andrew White the chance to settle in Maryland, he brought along with him nine servants, including Mathias who may also have been a Catholic. It is likely that many of the servants who came to America with the Jesuits were Catholic. We don't know exactly what Mathias did in the first few years he lived in Maryland. He probably worked very hard with other indentured servants building houses and the new church for the Jesuits. Many servants also planted and harvested crops for food. He probably traveled by boat to Maryland's Eastern Shore with Father White. The priests visited the Native American people who lived there. We know that one of the Jesuit priests identified Mathias as, "Mathias Sousa, a Molato" in an important land record. The record listed all of the people who came to Maryland with the Jesuits. Governor Leonard Calvert said the Jesuits owned farmland near St. Mary's City. The Governor allowed the priests and their servants to continue to lived and grow crops for food on this land. The term "molato" used by the priest, is the old spelling for "mulatto," defined in the seventeenth-century as a person of mixed African and European descent. It is sometimes difficult to find out about a person's race if they lived in the seventeenth-century. "Mulatto" can also refer to the complexion (lightness or darkness) of a person's skin. We can only guess if this refers to Mathias' ancestry or to the color of his skin tone. His last name, "de Sousa," is common in Portugal, where perhaps Mathias' father was born. We also do not know how Mathias de Sousa thought of himself. Mathias left us no written record of what he said or thought. Several priests and public officials who knew Mathias recorded all of the information known about him. Information from Maryland government records and court cases show that Mathias was treated well compared to than most people with African heritage in Maryland. The English settlers brought Africans to their colonies as slaves. African slaves in Maryland lived harder lives than the free settlers. Most slaves had little or no chance to earn their freedom. It was not considered a crime for masters to beat slaves and servants for misbehavior. Since Mathias was an indentured servant, he had to work for the Jesuits for four years. In 1638, the priests allowed Mathias to go free. Now he had to earn a living for himself. During his years of service to the priests, Mathias had learned how to sail the small ship owned by the Jesuits. Mathias decided to earn his living as a fur trader and sailor. He earned money by trading English goods with Indians for animal furs and food. For a few years, he continued to work for the priests. The priests made him captain of their trading ship. Later, Mathias was captain of a trading ship owned by John Lewger, who was Secretary in the Maryland government. In March 1641, Mathias was elected as a representative at a Maryland Assembly meeting. This proves that Mathias was no longer a servant. He voted as a citizen. Then, colonists had a very hard year in 1642. The Susquehannock Indians attacked the English settlers. Mathias could not trade for furs during the Susquehannock invasion. He had trouble paying his rent and buying food. He owed money to three wealthy men: Governor Leonard Calvert, Captain Thomas Cornwaleys and John Hallowes. There is no information about Mathias' life after 1643. No one wrote down what happened to him. The Indians killed some colonists in battles during 1643. Other colonists became sick and died from disease and lack of food. We don't know about the end of Mathias' life, but we do know that he lived as a sailor and trader. Important people like the Jesuits and John Lewger trusted him to be captain of their ships. Even if they called him a "mulatto," they trusted Mathias to lead white crew members on their vessels. His life shows that early Marylanders did not always dislike someone of a different race or heritage. The settlers thought of Mathias as a skilled and hard-working citizen. STANDARD 2: The history of students’ own local community and how communities in North America varied long ago. Standard 2A: The student understands the history of his or her local community. STANDARD 3: The people, events, problems, and ideas that created the history of their state. Standard 3B: The student understands the history of the first European, African, and/or Asian-Pacific explorers and settlers who came to his or her state or region. Standard 3C: The student understands the various other groups from regions throughout the world who came into the his or her own state or region over the long-ago and recent past. Berlin, Ira. "Chapter 1: Emergence of Atlantic Creoles in the Chesapeake," in Many Thousands Gone: The First two Centuries of Slavery in North America. Cambridge, MA and London: Harvard University Press, 1998. Bogen, David S. "Mathias de Sousa: Maryland's First Colonist of African Descent" Maryland Historical Magazine (Spring 2001) 68-85. Brugger, Robert. "From Province to Colony (1634-1689)." In Maryland: A Middle Temperament. Baltimore: The Johns Hopkins University Press in association with the Maryland Historical Society, 1988. Callcott, George H. "The Quality of Life in Maryland Over Five Centuries" Maryland Historical Magazine 2001 vol. 96, no. 3, pp. 272-302. Stone, Garry Wheeler. "Fur Traders and Field Hands: Blacks in Manorial Maryland, 1634-1644." Unpublished manuscript, 1984. In Maryland State Archives SPECIAL COLLECTIONS (Biographical Series) Mathias de Sousa file, MSA SC 3520-2810. This document packet was researched and developed by Nancy Bramucci.